There were two Ironman races over the weekend and having discovered some errors in my results set from Cairns it’s Ironman Boulder that gets first look (Cairns will follow later today). 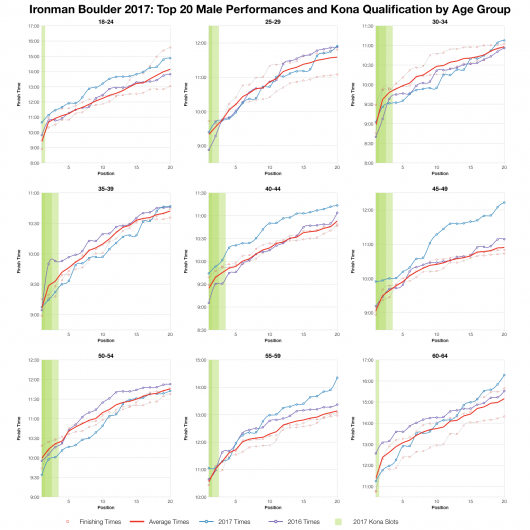 The Boulder race is only 4 years old and having proven tough for those not adapted to altitude, it attracts a relatively small field for the 40 Kona slots it offers. This year’s race appears to be typical for the event. 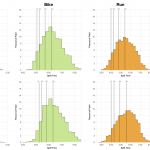 Comparing with results from the last 3 years, bike times are slower, but run times are slightly faster. 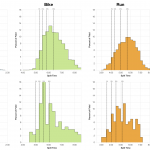 This balances out when we look at the overall where the median is very similar to previous results. The shape of the overall distribution is spread wider, there’s more weight towards the rear which is counterbalanced by more athletes at the front. 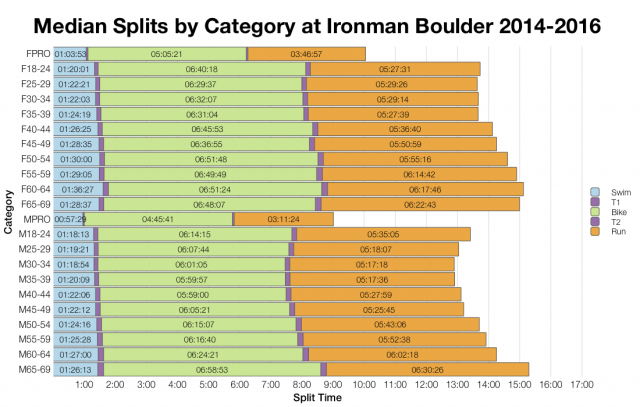 The fifth percentile time at this year’s race was faster. It’s also a typical year when looking at the DNS and DNF rate. The swim numbers include both and with the smaller field we see a drop off in percentage compared to the first two years (the 2016 stats appears to exclude DNS numbers). Bike and run DNFs looks to be comparable. Individual age group medians confirm that the board trend was slower bike splits and faster run splits. 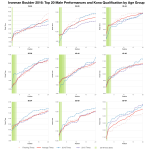 There is the odd exception when you drill down to this level, but it largely holds across age group divisions. The majority of the field comes from the US with Mexico in second. As in previous years, a lot of the athletes are likely to be local, but information on States wasn’t included in the results to confirm. 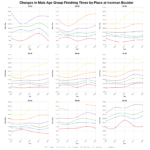 Tracking how times in each age groups have changed over the four races, there’s quite a lot of variation to deal with. 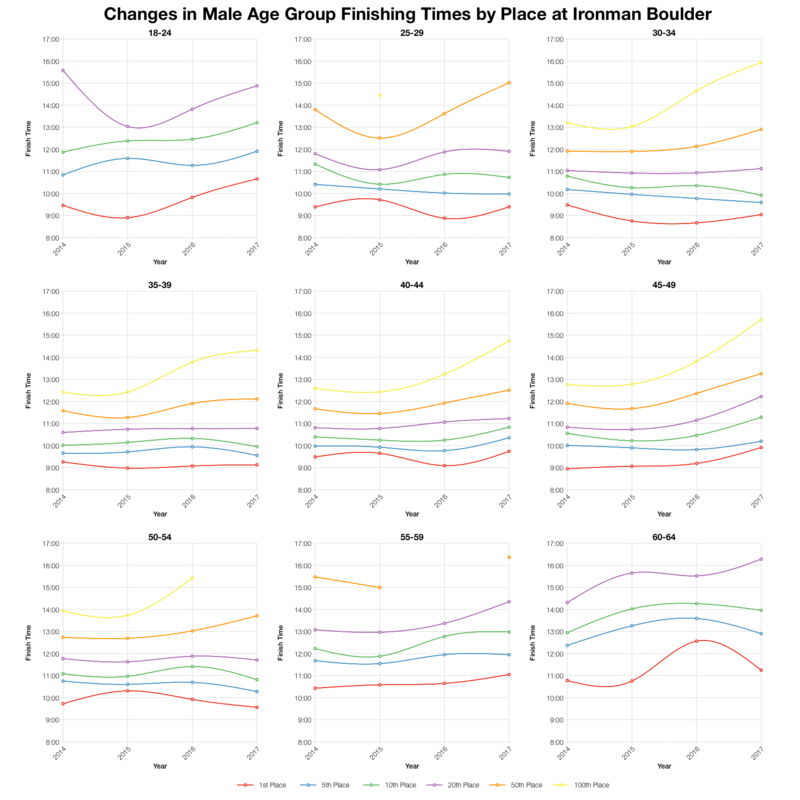 Some age groups saw a drop off in times this year, some didn’t. 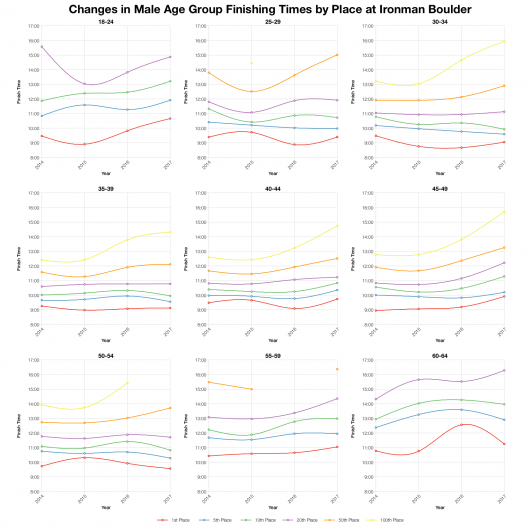 If a pattern does stand out it’s that those further back in the age groups slowed the most. As you get towards the front of the age group any drop off in time is small. Based on start numbers for the race I’ve estimated the above allocation of slots and from that the times that would automatically qualify (without roll down). Given DNS numbers aren’t entirely clear there’s likely some variation with the actual slot allocation and times. 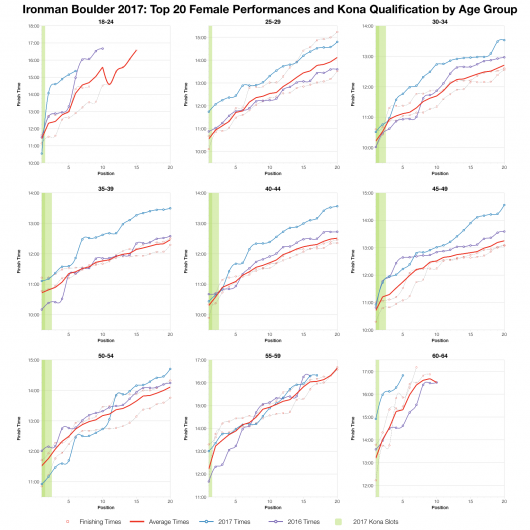 More information on Kona qualifying times across races can be found on my Kona qualification page. Finally, the top twenty in each age group gives a good picture on how qualification looked at this year’s race. I’d sum it up as slow to average. 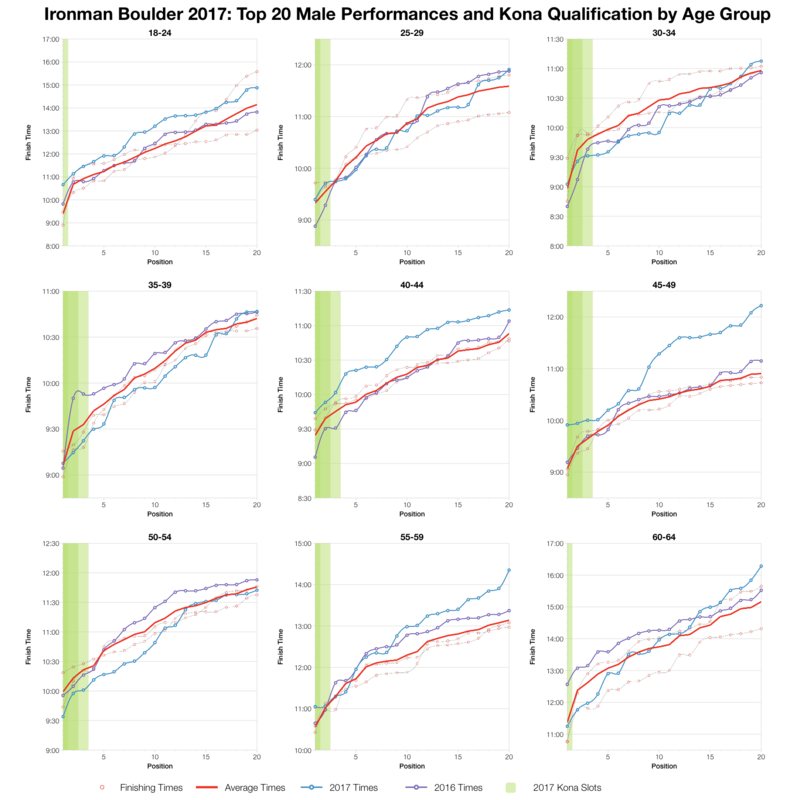 There are some age groups that came out a little faster and a few more that were clearly slower, but they mostly fall somewhere close to the average line. The front of the race wasn’t too different to before, it’s towards the back where we seem to see most slower times. 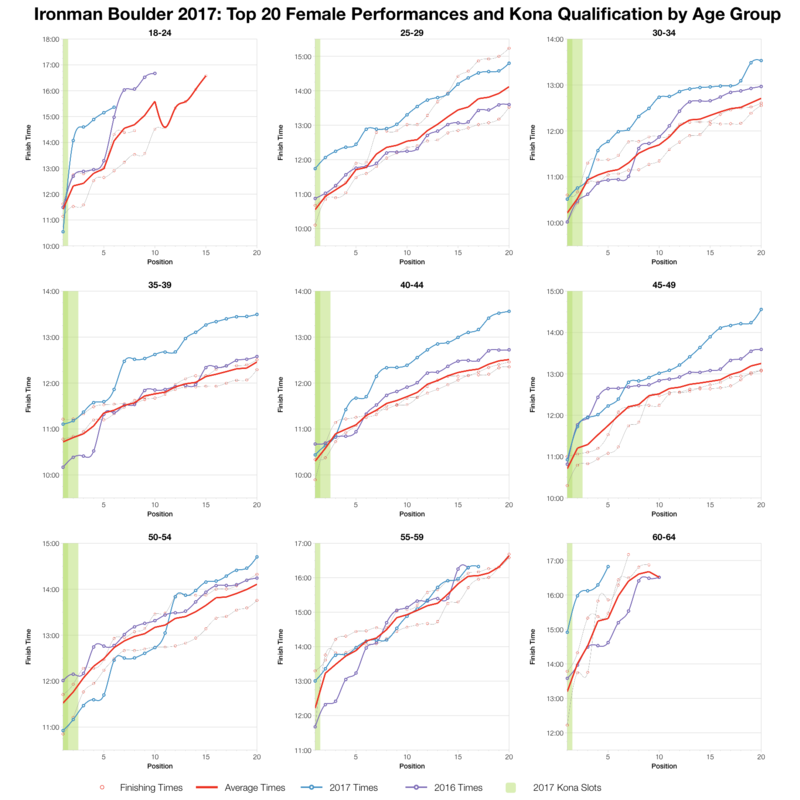 You can access a spreadsheet of the full results and splits from Ironman Boulder 2017 on my Google Drive.